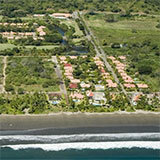 Spectacular Ocean View Condominium within the Luxury Reserva Conchal. Fully furnished Condominium for 8 packs. 3 Large Bedrooms each with its own large private bathroom. 2 bedrooms come with each a king size bed, and 1 bedroom with 2 full beds. Including Private Parking lot of 18 M2. Complete fully equipped kitchen, with pantry and washer and dryer. Kitchen appliances includes built in oven, microwave oven, electric cook top, dishwasher, refrigerator with ice maker, blender, coffee maker and other. Living room / dining room with great finishing’s. 2 flat screen TVs, one in the master bedroom and 1 in the living room. Spacious balconies with ocean view. Electronic keys, triple play telecommunications access, garbage shoot etc. Reserva Conchal features a spectacular beach, 1st class Club House & Beach Club, Gym, Spa, Restaurants, 18 hole Golf Course, Hiking Trails and much more. You need to experience Conchal to appreciate its beauty. We invite you to come take a look.